Kentucky Bourbon producer Heaven Hill Distillery is celebrating after filling its eight millionth Bourbon barrel. The eight millionth barrel was “bunged off” by master distiller Denny Potter and president Max Shapira during a ceremony in the distillery’s cistern room, which was attended by company executives and local dignitaries. Heaven Hill, which currently has more than 1.5 million ageing Bourbon barrels, is the first local, family-owned Bourbon producer to have filled eight million barrels. Shapira said: “As we roll out the eight millionth barrel, we recognise the dedication to quality and thoughtful innovation that has led Heaven Hill Distillery to this milestone. 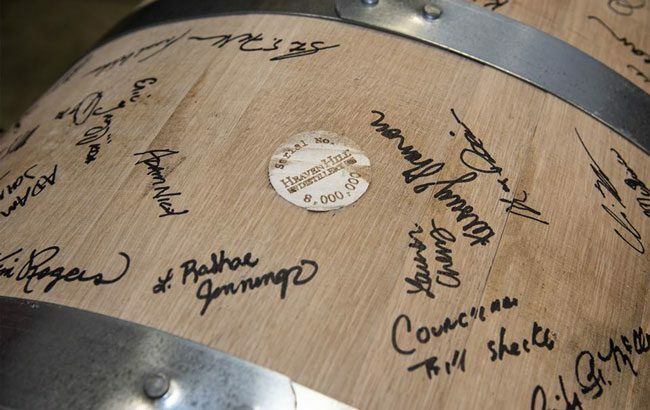 During the ceremony, guests toasted the milestone barrel with a glass of the distillery’s Bourbon, before it was signed by Heaven Hill employees and left to age in Rackhouse Y, where it will be displayed alongside Heaven Hill’s other milestone barrels. This benchmark barrel follows several other company milestones over the past months, including the filling of the 1,000th barrel of Evan Williams Bourbon Experience and the distillery’s announcement that it plans to expand its Bernheim facility, which will make it the largest single-site Bourbon distillery.